What do we mean when we say "clergy and laity"? Fr. Tom says there is a real sense in which we are all both! Is there a prescribed physical place where the liturgy is to be served or not served? Fr. Tom traces the history from the "house church" to the present day. Where is the Divine Liturgy to be celebrated and by whom? Fr. 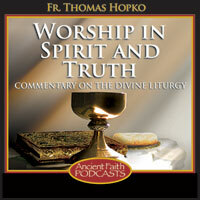 Tom traces the early practice of the Church and relates it to what we are doing today. Today Fr. Tom speaks about the importance of the offertory prayers said after the Great Entrance. In particular, he talks about how they are prayed in the Liturgy of St. Basil the Great.